Wild Artichokes for sale. Buy online at Zingerman's Mail Order. Gourmet Gifts. Food Gifts. In Italy, they're called carciofini selvatici, which is the name you'll see on the label. 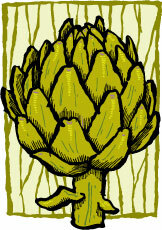 They're a variety of artichoke that grows wild in Calabria during April and May. Picked by hand, they’re dethorned and cleaned, then blanched for just a few minutes so their texture remains firm. About the size of an acorn, they’re bottled with olive oil, wine vinegar, salt, black pepper and a little bit of red chili pepper—a spice you find in many Calabrian foods. The red pepper is so subtle you won’t notice its faint spice until you’ve had two or three, a feat that’s way too easy to accomplish with artichokes this good. Throw a couple in a pasta dish. Add them to salads. Serve alongside some sheep’s milk cheese. Or follow your heart, open the jar and just eat 'em straight up. "So happy that I finally have my jar of Carciofini Selvatici !!! Not sure whether to just rip into it and gobble them up now or treat it as a treasured Crown Jewel and have it as a Christmas treat. Time will tell!"